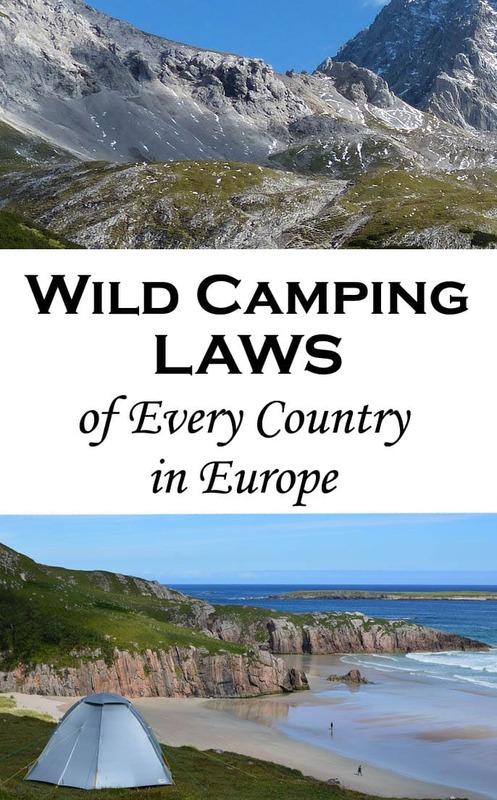 I love wild camping in Europe, but had yet to find a complete list of wild camping laws for every country. So, I decided to make one. Let me just preface this by saying that paid campgrounds definitely have their place. 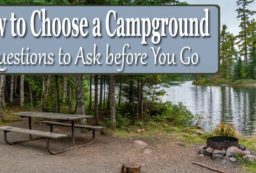 Campgrounds are great for people who are just getting started with camping and don’t have a water filter or know basics like how to poop in the woods. And there was that time I got sick while wild camping. I was happy to have a paid campground to go to where I could puke in a proper toilet. With that said, I firmly believe that wild camping beats campgrounds. I am lucky enough to live in the Balkans where wild camping is legal in most countries. 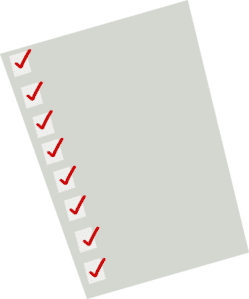 For any of you who are in Europe or want to visit, here is a list of the wild camping laws of every country in Europe. *Just because wild camping is “illegal” in some countries, it doesn’t mean that you shouldn’t do it. 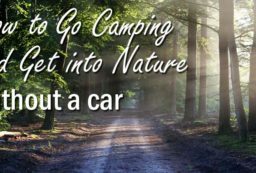 I know many travelers who have wild camped all over the place (including not-so-wild places like city parks). If you are discreet and respectful, no one is likely to bother you. Even if the police do come, they will probably just tell you to leave. I’m sure some people have gotten fined, but I don’t know of any. So, it is up to you to decide whether the risk of getting a fine is going to detract you from trying wild camping! Albanians have a habit of ignoring traffic laws, smoking regulations, and pretty much any rule. 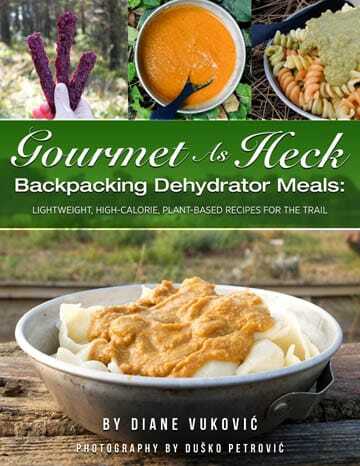 So, if there is a wild camping law on the book, no one is paying any attention to it. The country is full of wild places where you can easily camp. I personally have wild camped in Albania a few times and loved it (my favorite country for camping). The only time you might have trouble finding a wild camping spot is on the beach in the summer. I recommend Gjipe Beach. 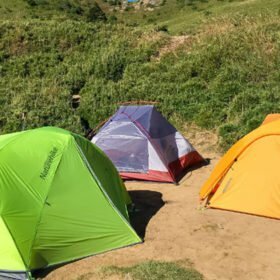 Wild camping is legal in Armenia. Locals tend to be very hospitable and curious, so be prepared for some locals to come check out your tent and invite you home for coffee. There is plenty of wild land in remote areas – but beware of wolves and animals! Stray dogs can be a problem in the countryside. Wild camping in Austria is not legal. However, if you are in unprotected forest (not in a National Park or reserve), you may set up a “planned bivouac” for one night. So, tents are not permitted nor are bivvy sacks for more than one night. You can read more on the topic here. The country’s constitution states that all forest and farm land is publicly owned, thus you are able to wild camp legally. Apparently 40% of the country is covered by forest, so there should be plenty of places for wild camping! There isn’t much forest or nature in Belgium, so it is no surprise that wild camping is illegal. However, there is a “hidden route” where pole camping is allowed. You can find more info here. Wild camping is legal. However, there are still a lot of landmines buried in Bosnia. Never camp on land which has obviously not been tended in a long time. And obviously never camp on land surrounded by those “Beware of Mines” signs! Croatians live off of tourism, especially on the coast. So, be prepared to find big “No Camping” signs all over the place. However, just because the laws state otherwise, it is still perfectly possible to find remote places in Croatia for wild camping – just be discreet! I couldn’t find out the legal status for wild camping in Cyprus. However, I was told by a local that you can wild camp all around the island so long as it is not in a protected area (I’m assuming he didn’t mean 10 meters from a beach-front hotel though). Apparently, the worst that can happen is that a forest ranger will come and ask you to leave. What Cyprus IS really strict about is fires. If you light a fire, expect to get a 600 euro fine! Czech basically have the same wild camping laws as Austria. It is permitted – but only in unrestricted areas for 1 night and without a tent. In Denmark, wild camping is NOT legal. If you are caught camping outside of a campground, expect to pay fines. However, there are some places where you can “pole camp” legally. You can find a map here. Estonia has great public access laws. Wild camping is permitted on government lands (called Riigimets) – though some National Parks might have restrictions. There is a big culture of wild camping and you shouldn’t have any problems from locals. Note that the National Forest Center (RMK) has many official campsites which even have latrines, so you don’t even have to camp wild to camp free. Finland has very liberal public access laws. You are allowed to wild camp, so long as you are a suitable distance from homes or cabins. In the province of Aland, the right to wild camp is not necessarily recognized. Note that there may be some restrictions in protected areas. In theory, if there is no “No Camping” sign, then I guess you could legally sleep there. However, I wouldn’t want to argue the practicalities of the law at 3am with a police officer who just woke you up. Better to be super discreet or just ask permission first. You can download the law here. Note that a lot of people have said they had no problem wild camping in France (being respectful, of course). So, it seems to be well-tolerated even if it isn’t legal. Wild camping is legal and you will find plenty of very remote places for camping. I personally have never wild camped in Georgia, but I heard that you should avoid camping near flocks of sheep because the sheep are guarded by aggressive dogs! Wild camping is illegal in Germany. You are allowed to sleep one night in a bivvy sack outside of private property and not on nature reserves or restricted areas. You might be able to wild camp with a tarp tent. However, whether that counts as a tent is up to the discretion of whoever found you. Be warned that anti-camping laws are actually enforced!!! Wild camping is illegal in Greece. However, wild camping is tolerated in many areas. In the mountains (not in a National Park), for example, you should not have a problem. The hardest part is trying to find a wild camping spot on the beach because so much beach property is owned by hotels and overridden with tourists. I found conflicting information about whether wild camping is illegal or legal in Hungary. However, I personally have wild camped in Hungary a couple of times and never had any problems. Just note that there aren’t too many wild places in Hungary. You’ll probably be near villages. Either ask for permission or go somewhere really hidden. According to the Visit Iceland website, wild camping is legal if you find yourself away from registered campsites. In residential areas, you are allowed to pitch up to three tents on uncultivated land for one night only. In the highlands, you can pitch as many tents as you want and there are no listed restrictions for how long you can camp. Note that these laws only apply to tents and not to RVs or caravans. Wild camping in Ireland is not legal. Most land is privately owned and expect a lot of fences, walls, and locked gates. In remote places, however, wild camping is tolerated – such as for cyclists going long distances. Wild camping is illegal in Italy. It apparently isn’t very well tolerated, though you might be able to find some places north of Rome and in the South where you can get away with it. Wild camping is legal in Kosovo and very well tolerated. Locals are hospitable and the nature is gorgeous! I recommend visiting Rugova Gorge. Latvia has great public access laws. You are allowed to wild camp, so long as you are outside of designated protected areas. Like with other Baltic countries, wild camping is legal and even encouraged. Wild camping is illegal and strictly enforced (no surprise here). Not only is wild camping illegal in Malta, but camping in general is not encouraged. There are only a couple official campsites on the island. However, according to this article from Air Malta, you can get special permission from the local council where you want to go to wild camp. I can’t find any info about whether wild camping is officially legal or not, but sources do say that wild camping in Moldova is tolerated. Wild camping is illegal in the Netherlands. However, the Forestry Commission has established a system of “legal wild camping” using pole camping. You can read more about wild camping in the Netherlands here. Wild camping in Norway isn’t just legal, it is encouraged. The country has one of the most liberal public-access laws and a culture which believes in man’s right to nature. Under the law, you are allowed to wild camp for up to two nights on uncultivated land no closer than 150 meters from a house or a cabin. That means land which is not tilled or in use (such as for crops or farm houses). In mountainous areas, you are allowed to wild camp legally for longer. Wild camping in Poland is illegal. You are probably thinking of the Tatra and Karkonosze Mountains if you want to wild camp. Unfortunately, those mountains are very crowded and there is a good chance you will get caught if you wild camp there. You aren’t even allowed off the paths at those mountains. However, you might be able to find secluded places in other parts of Poland (outside of National Parks) where you could get away with wild camping. Wild camping is illegal in Portugal. However, outside of the summer (and away from touristy places), you can apparently get away with wild camping. It’s a bit of a grey area. Wild camping is illegal in Romania, but it is widely tolerated and you shouldn’t have any problems – especially outside of reserves. Apparently, the worst that is going to happen is that some forest rangers might ask you to move or pay a small fee (like 2-3 euros) for camping. Campfires are illegal, but also not enforced. Wild camping is legal in Russia, except on church lands, private lands, and near water reservoirs. I was told by a local that there is a “Federal Law granting free unmotorized access and camping within 20 meters from waterline of almost all lakes, rivers, and seas. Even the private land owner cannot legally claim this 20-meter strip (unfortunately they do it illegally quite often). The only exception is a handful of lakes which are surrounded by private lands, but it’s extremely rare case. The private land is always recognized by a tall wall, so you cannot mistake it. Also the nature reserves may have their own rules regarding the camping (like in the rest of the world). There aren’t any laws about wild camping. If there are, they aren’t being enforced. :p The only times you might have problems wild camping in Serbia is if you are in a National Park or Reserve. Camping is usually forbidden there. Note that Serbians are very hospitable. If they see you wild camping or you ask to camp in their field, they will probably invite you inside. Wild camping in Slovakia is legal. However, it is illegal in areas with a level 3 protection and above (meaning you can’t wild camp in the High Tatras or national parks). You also aren’t allowed to wild camp in forests – but “forests” is defined by the map, not presence of trees. I was told that wild camping in forests (even ones marked on the maps) is tolerated. Be careful about making a fire though – that is generally prohibited. Wild camping is technically forbidden in Slovenia, but it is widely practiced and tolerated. However, you probably shouldn’t try to wild camp in the popular places (such as Lake Bled, Bohinj, and Triglav park). In those places, you could end up with a fine. The law also states that it is prohibited to free camp within 200 meters of the sea, within a few kilometers of military installations, within a few kilometers of a regular camp site, and in protected areas like national parks, natural parks, bird sanctuaries called ‘ZEPA’s, (Zona Excepcional de Protección de Avifauna), etc. However, there is the new law under the Spanish Constitution of 1978, which created seventeen ‘autonomous regions’ each with considerable, though varying, powers to make their own legal codes with their own territory. These areas fall under national rules and wild camping IS permitted: Basque Country, Cataluña, Madrid, Castilla y León, Castilla la Mancha. But in these areas you still can’t camp near the beach, in national parks, protected areas, etc. Also, a lot of the land is privately owned, so you’d have a hard time finding anywhere that would even fall into the permitted wild camping areas. You can read more about wild camping in Spain here. In the linked article, it says that the fine for illegal camping is 30 euros per square meter of space used, per day. However, this link says that the fine is up to 5000 euros! 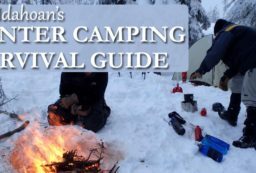 If you are just looking for a place to camp for free but not necessarily wild, this article has recommendations. I’d avoid making a fire while wild camping in Spain. The locals might turn a blind eye to wild campers in some areas, but the risk of forest fire is very real and the fire will likely quickly attract police! Wild camping is permitted. In fact, Swedes are quite proud of their rules which state “don’t disturb, don’t destroy” and “freedom under responsibility”. You are allowed to leave your tent up for 2 days. Campfires are permitted, but only if there isn’t a fire prohibition in place, and the fire is “under control” and “suitable equipment” is used. To see if there is a fire prohibition in place, you’ll need to check with Länsstyrelsen. There is also an app “Brandrisk Ute” that you can use to check if fire restrictions are in place – just use the map feature to see. Wild camping in Switzerland is a bit of a gray zone. While it is technically forbidden, it is tolerated in remote, wide-open places. In some places though, the police are stricter – especially about camping along rivers, lakes, and reservoirs. Apparently the best practice is to ask the local police first if it is okay for you to wild camp. Wild camping in Ukraine is legal, though some national parks only allow camping in designated areas. Even these rules apparently aren’t strictly enforced. Just note that you might need special permission to camp near border areas. You don’t want border control to mistake you for a smuggler! Wild camping is England and Wales is illegal almost everywhere, unless you have a special permission. The exception is Dartmoor where the camping rights are written into the National Parks & Access to the Countryside Act. However, wild camping is tolerated in some areas of England. Read more about wild camping in England here. Wild camping is legal in Scotland under the Land Reform Act of 2003. You can basically wild camp anywhere. However, do note that there are some exceptions. 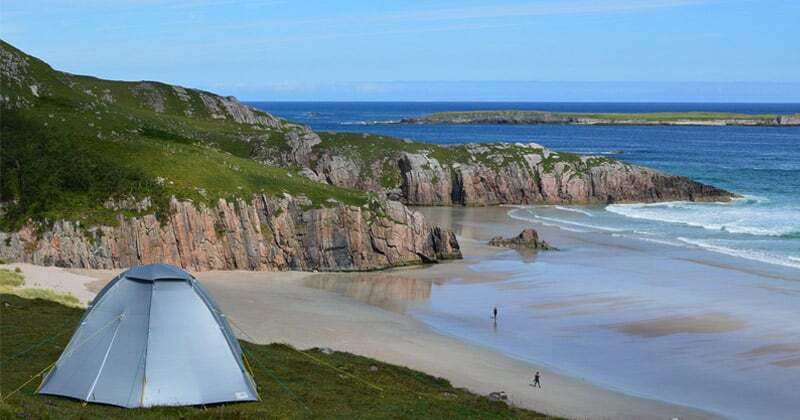 For example, it is not permitted to wild camp on the island of Tiree in the Inner Hebrides and East Loch Lomond. Do your research before you go! *I did my best to research all of these laws. If I made a mistake, please let me know so I can fix it! And, of course, remember to be responsible and practice Leave No Trace whenever wild camping. I would like to add about camping in Ukraine, that although it is legal, it is better to camp on the good distance from the villages, and hiding somewhere in the forest, to avoid the unwanted attention of the locals. If you camp somewhere not high in the mountains, take care of your stuff and pack all the valuables inside the tent. Thanks for the tips! I’m also always worried about gear getting stolen when I camp near villages/civilization. 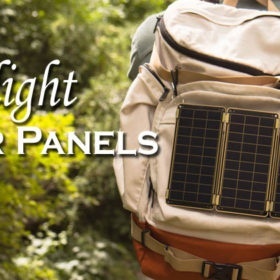 I bring my “expensive” smaller gear with me, like my knives and headlamps. Have never had a problem though! Emergency biohacking (without a tent) in Switzerland is always allowed. Camping (with a tent) is fine above the tree line. 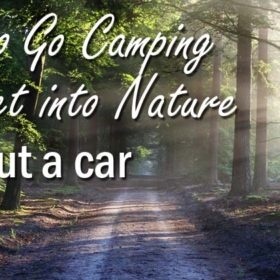 Camping is explicitly prohibited in nature parks, nature protection areas, wildlife protection areas, zones where hunting is prohibited. The laws are all about protecting wildlife. Basically the more sensitive the ecosystem is, the more you are expected to take extra care, or the more prohibited it is. The laws can also be different in each canton. Thanks for the info and the link!!! 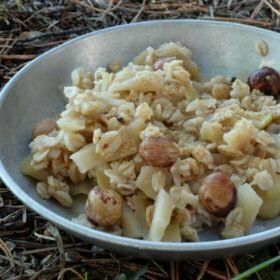 Let me please, to give som info about the wild camping in Hungary. Firts of all, it is not prohibited, but it is restricted. 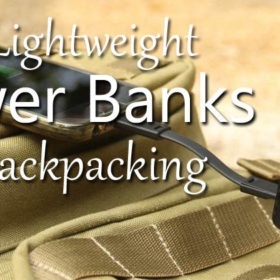 For NO MORE than 24 hours, you are allowed to camp anywhere in the forests and along the riverside. Next day you have to move and have to keep the area as you’ve found it (so, you have to clean your garbage and so on). By other words: if you want to roam in the wild in Hungary, sleeping at other places day-by-day, it is ALLOWED. If you want to pass more than a day in the wild at the SAME place, that is not allowed. That’s all. In nature reserve areas and national parks it is required to get the permission of the park authorities to wild camp but in the case of one or two tents (1-4 people) rangers and foresters usually are tolerant even if you do not have any permission as long as you follow the no trace rules. Staying in one place for more than 24 hours (outside of the mentioned areas) is not really illegal but always depending on the permit of the local forestry service. Hello all! I would like to put some update on Czech Republic wild camping. It is prohibited in national parks (but for example in Sumava there is possibility to use temporary overnight camp, link with map: http://www.npsumava.cz/en/3336/sekce/temporary-overnight-camp-sites/). Outside national parks there are basically same rules as for Hungary, you can stay for one night without fire and than you should move to another place. I was wild camping there many times and never was problem. Usually was not problem to find some more hidden place. Hi, I can confirm, I come from Czech Rep., now living in Austria and the camping rules are not at all alike. I read somewhere that wild camping is allowed in the French Pyrenees if staying over 2.000m, which is what I did and what the guardian of a refugee nearby confirmed to me. Not sure if this applies in the Alps. Regarding Spain, I confirm that what you wrote about Aragon is (sadly) completely true. Wild camping in Bulgaria is LEGAL. There were some attempts a while back to make it illegal, but they failed. There’s no regulation prohibiting it. There are some restrictions in national parks and they vary from park to park. If you do it in a discreet and respectful manner, I’m sure no one will bother you, let alone fine you.